Okay, first off, I'm having a ton of trouble with StockCharts tonight, so I'm going to use different software for today's charts because I'm tired of wasting time and my wife is undoubtedly tired of listening to me yell at the computer (hopefully, this is only for this update and things will work on Friday! The software, not the yelling.). We'll also look at a chart from Friday's update, sans new price action. This is somewhat akin to the way I felt back in 2015 shortly before the flash-crash -- when many technicians were suggesting a nested third wave rally was about to launch to the moon, but I was calling a top. We're in a similar position now. Equities are in a position where bears can take the wheel if they're so inclined, but no indices have given bearish confirmations just yet. That said, INDU does look very toppy on a near-term basis, so unless/until bulls can reclaim the ATH there, I'm inclined to lean bearish on even the major indices, at least for the near-term. In conclusion, as I've been discussing recently, a number of markets appeared to have been aligning -- and now finally appear to be aligned in a way that makes a bearish move quite possible over the coming sessions. If RUT, BKX, and NDX have all topped (or nearly so), then there is in fact potential for us to be on the cusp of a fairly significant downdraft. So as long as bulls don't pull a surprise breakout from these patterns, it makes the most sense to continue to lean bearish and simply "trade what you see" (as they say). Price has overlapped the start of the prior breakout, and normally that isn't particularly bullish, so I would probably have to be a seller on any retest of the all-time high. SPX then presented a perfect entry for anyone who was bearishly inclined as it did indeed retest the all-time high -- before turning and dropping 30+ points. This has been an incredibly challenging market to chart, because markets have been moving in a very piecemeal fashion. There have been no "obvious" topping patterns, nor have various markets had the good graces to align and move together for the sake of clarity. This is evidenced by the way I've had to chart each market quite differently -- calling tops in some (RUT and BKX particularly), while allowing SPX a little room to run even after I first called the BKX/RUT tops. Forgive me for a bit of horn-tooting, but my worst fear is always steering my readers wrong, so it's been a huge relief for me to watch each individual market top and reverse directly from the specific price zone I'd noted for each individual market. 4. And when I finally talked about SPX again (last update), it reversed on a the retest of the ATH, where I said I'd have to be a seller. Considering the diversity of these indices (and the patterns therein), that's some pretty darn fine chart work, if I do say so myself. Anyone can use mechanical system to identify things like "Hindenburg Omens," but locating specific price reversal zones on four completely different markets, and hitting all four of them, is something else entirely. At this point, the worst case scenario for anyone who's been trading these charts is that they now have profits to protect. And there's something to be said for protecting some of those profits in a market environment that has been incredibly hostile to bears for the past 8 years. For me, I plan on protecting about 50% with trailing stops, while letting the other 50% ride with stops near my entries (for now, anyway) -- because as we'll see in a moment, there's potential for this move to be significant, but that's not guaranteed (nothing in the market ever is), so balance is in order. 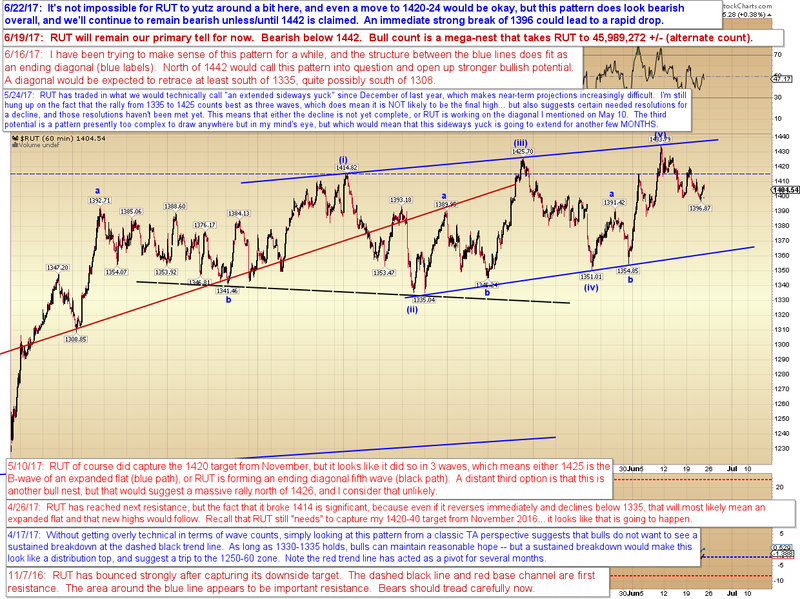 RUT did manage the trip to 1420-24, and then reversed. By all indications, RUT appears to be headed to 1375-80 -- the main question is whether it wants to form a more complex sideways grind first. For now, we'll assume it's headed lower fairly directly, because there are enough waves in place for it to do so. Bears would like to see it sustain a breakdown at 96 to help confirm the targets, but if it does: Beyond 75-80 and the next target is the zone near the lower blue boundary of the diagonal. In a perfect world, it will ultimately head to the targets discussed on June 16, but bears have to stay cautious, especially as (and if) it head lower, because there's no law that says the diagonal can't add another wave, as long as it stays below 1442. And, of course, nobody wants to ride drawdown from 1377 to 1442, which is why we protect some of our profits along the way. 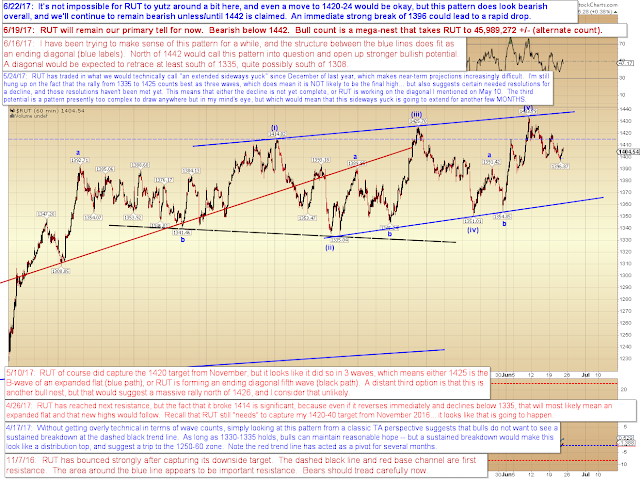 In conclusion, the bearish reversals I predicted happened across the board. From here, we'd next like to see NDX sustain a breakdown at its prior low to help rule out screwy bull moves (8 years of watching bear patterns blow up gives bears no choice but to stay on their toes at all times). I can't help but be gun-shy after 8 years of conditioning, and being gun-shy has allowed me to escape many countertrend trades with profits -- but everything does look as promising as it possibly can for bears at this stage. But the bottom line is, NOBODY should lose a red cent from here -- the only question is whether we'll walk away with a little bit of profit, or a lot. And that's a good problem to have. Trade safe.